Phillip Done has written a witty and heart warming collection of tales from 20 years of teaching. Even though the stories are humorous, the deep affection Done had for his students is evident in his writing. Reading of his classroom adventures, I was touched by just how much he cared for his students, which is a great quality in a teacher. He apparently had quite a life teaching little ones and his account will leave you smiling. Phillip Done loved teaching and loved his students. I am delighted that he put his tales from the classroom on paper for others to enjoy. It is a great read for anyone who has ever taught or who loves children. Each chapter covers a month and the chapters are not very long. You can easily read just a little at a time, but if you are like me, you will find it hard to put this book down! 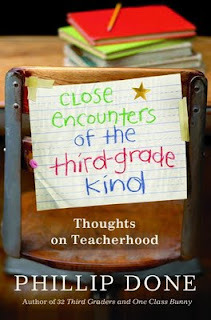 I highly recommend Close Encounters of the Third Grade Kind. It will bring a smile to your face and your heart. Hachette Book Group is giving 5 of my readers their very own copy of this great book! All you have to do to enter is tell me your favorite memory from elementary school or your favorite teacher. That's all there is to it! Deadline to enter in Wednesday, 11/04/09 at 11:59pm CST. This giveaway is limited to the US and Canada only, no PO Boxes allowed. Ramblings of a Texas Housewife Product Review and/or Giveaway Disclosure- I have received no compensation from Hachette Book Group other than the offer of free product to review and/or giveaway. Any opinions expressed on Ramblings of a Texas Housewife are my own. My reviews are never reviewed or edited in any way by sponsors. Id love to win this book for my 3rd grade teacher daughter! She surely could relate! This has got to be close to "Kids Say the Darnedest Things" by Art Linkletter. Would love to win this one. My memory is of my third grade teacher. She was a very special woman. I remember her driving me home to meet with my mom for her school conference. She did this with all the kids. I think she wanted to see what kind of household the kids were raised in to help give her a better understanding of each student. She was very wise. I had a 4th grade English teacher, Miss Nelson, she knew we loved to read books and always loaned out her personal library of books to us. With 11 kids in our family we were always sharing our books and couldn't afford too many of our own, just before school ended she dropped off box books for us to keep. I still have the books. My favorite teacher was Mr. Vrba in 6th grade. My favorite teacher was Miss Rhodes, my 1st grade teacher. She was young and pretty. Most of the other teachers were older and I thought I was so lucky to have her for a teacher! She also taught me to love books and I still do! My favorite teacher was Mrs. Daugherty in 6 grade. Thanks for the giveaway! My favorite teacher was my second grade teacher Mrs. Mattingly She had a way of making lessons fun and interesting. My favorite part of elementary school was art! I remember dipping wax candles around the christmas holidays. My favorite memory was learning the alphabet in K..Our teacher was so sweet and patient. We were able to bring items from home to represent the letter we worked on and she let us tell why we brought the item in. My favorite teacher was my sixth grade teacher Miss Ball. She was very involved and interested in her students lives. She came to basketball, soccer, volleyball games and more to support her students and cheer them on. I also learned so much from her and had a ton of fun while doing it. I remember the metallic stars that I would receive on my drawings/papers/tasks! My favorite teacher was Mr. Litzke from history!! He just had an awesome sense of humor and knew how to capture your interest!!!! My favorite teacher was Mrs,Sellers! Whata a nutty lady,funny looking back on it! One of my favorite grade school memories was of the field trips we took. I remember one time we even got to go on a train ride. My most memorable teacher was my home economics and foods teacher. She was also the director for a club I was in, FHA. I spent a lot of time with her because we'd go on trips when I was a peer educator. She had a great sense of compassion and caring. My favorite teacher would be my kindergarten teacher Mrs. Bruener. She was great and she and I still talk. Thanks for the contest. My favorite memory was going to school early and participating in the relay races. Also my favorite teacher was Mrs. Ides in 3rd grade. She made school fun. My favorite teacher was my 3rd grade teacher, Mrs. Doss. Thank you! I had the best kindergarten teacher ever. I still remember her birthday was on Groundhog's Day. My favorite memory of elementary school was the fun that we had at recess. Our school was rural, and we had a huge metal slide and nice swings and lots of land to run around on. My favorite teacher was my 4th grade teacher, Miss Pierce. She was gentle and kind and was very respectful of us children. I think my fave teacher was Sister Bernadette. She was so sweet. My fav teacher was my earth science teacher. He actually taught me a lot and actually encouraged me to learn more on my own. My favorite teacher was my second-grade teacher.